Curriculum Overview – Literacy blocks will address reading and writing. We will be unlocking the mysteries of our language in order to become better readers and writers. Reading will include author and genre studies, whole class and small group book clubs, and independent work. We will study author’s craft, conduct research, and read and write personal narratives, poetry, and other genres. In spelling, we will explore word patterns, word study, and learn the most frequently used words in an effort to understand our complex language. Our main message is read, read, read! In mathematics, students will investigate patterns and relationships while solving problems and developing good number sense. As a team we have decided to use problem solving as our foundation in all four classes. We will be covering algebraic thinking, number sense and operations in base ten. We will explore the four operations while we work with whole numbers, fractions, and decimals. Measurement and data, geometry, and probability are included in our math program. Some class time will be spent on applying facts in math, and students will be expected to practice and reinforce the facts in their homework. Common Core standards set the expectation for students in grades 3 and 4 to have all facts to 10 memorized in all four operations. Science and social studies will be interspersed throughout the school year and the big essential question we will consider is: what is a system? Our investigations will focus on space and Earth science. After winter break we will be studying ancient civilizations. As third and fourth graders we will explore new civilizations and ask deeper and more sophisticated questions. We will emphasize world geography within this study. Outdoor Education - Our year will have an exciting, hands-on beginning on our outdoor education week. On Monday, September 26, we are planning a day field trip to Dinosaur Ridge. On Tuesday, September 27, to Wednesday, September 28, we will have our overnight at Camp Timberline, where we will explore geology and nature while connecting with friends old and new. On Thursday, September 29, we will have a local guided hike. Finally, we will end our outdoor education week with a walking field trip on Friday, September 30, to the South Boulder Creek for impermanent art and poetry. An outdoor ed packet with more information will be sent out in the weeks to come. Please email me if you are interested in volunteering for any of the outdoor ed experiences. Conferences - First semester conferences are scheduled for Wednesday, October 19 - Friday, October 21. Please note that there are regular days of school on the Monday and Tuesday before conferences begin. These will be essential conference preparation days for all students. Conferences are a fundamental piece in the home-school connection. These dates are not a school vacation and students and families are expected to be here for their conferences. Snacks and Water Bottles - Your child may bring one healthy snack to eat during our morning snack time. We will be having a mid-morning snack daily. We try to help the children learn that the goal of snack is to keep them comfortable and fueled until lunch. We encourage them to not use this as a mealtime. Please be aware that as students transition back to a school schedule and grow throughout the year, their appetites may change. Fridays are longer than other mornings and children may need a bigger snack. I would like to suggest that all children bring a water bottle to school every day. These can be refilled as needed at the classroom faucet. We encourage children to bring a clean water bottle to school at the beginning of the week, leave it at school throughout the week, and then bring it home for cleaning over the weekend. Specials and A&S – Computer lab, Spanish, and art will occur for a week each month. On weeks when there are not specials, the teacher will lead activities that are movement-based. There will be four arts and science sessions throughout the year. Students will have the opportunity to explore a variety of interests in movement, music, service learning, and performance through these classes. Dress Code - Please make sure your child has clothes that s/he can move in every day. Students are expected to wear close-toed shoes every day. Refer to the Parent Handbook for further info on dress code. Drop Off and Pick Up– Doors open at 8:20am. Students are marked tardy after 8:30. Research shows that students are more prepared to learn when they arrive on time and begin the day with the class. Please make an effort to arrive on time daily. Monday through Thursday, students are dismissed at 3:30pm. On Friday, dismissal is at 12:45. All students will exit the main doors. Please discuss a pick up plan and location with your child. Students not picked up by 3:45 will be sent to the office. Please contact the front office if there is a pick-up delay. Birthdays - Birthdays in 3/4 are celebrated as a classroom community event. Children enjoy acknowledging each other in a small way. Children who have birthdays during school holidays or summer break are invited to pick a day when we are in school to celebrate. It can be a half birthday or any other day of your choosing. Birthdays that fall on weekends can also easily be scheduled. Please communicate your wishes via email with the teacher to make sure your child’s birthday celebration gets on the calendar. Finally, you are welcome to bring a special birthday snack for your child. Please keep treats scaled down as we do celebrate so many birthdays over the course of the year. We do have gluten, dairy, egg, and nut allergies in our classroom. Please provide a snack (or an alternative snack) that can be enjoyed by all students. Classroom Cleaning - Please help keep our classroom clean! You can chose to either clean the classroom or donate money for professional cleaning services. If you signed up to clean, please add your name to the cleaning schedule. If you have any questions, please contact our liaison Rei: rytilton@gmail.com. Volunteering - After the first month of school, parent volunteers are welcome in the classroom. Parent volunteers are able to help in the classroom, to chaperone on field trips, and to assist with clerical work. A volunteer sheet is included with this packet. If you would like to support us as a volunteer, please let us know what you enjoy doing and some times that work best for you. You must have completed a background check in order to volunteer in any capacity. We encourage all parents who may want to help to do this as soon as possible. The office can provide support for this process. Also, please let us know if you are interested in jobs that can be done at home. Look for a volunteer sign up from Rei, our liaison, in the weeks to come. Website & Parent Communication – Weekly updates will be posted on the class website (http://emmysclass.weebly.com). Please be in the habit of checking the website frequently. Pictures, homework assignments, sign ups, celebrations of learning and more will all be available through the website. For any additional communication, you can contact me by email or in person. After school is the best time to contact me. Rei Tilton is serving as our classroom liaison. Please look for occasional messages from her. Additionally, she is looking for a liaison partner. Please let me or her know if you're interested. Planners - Your child’s spiral notebook will be their planner for the year. Teachers will guide the students in recording homework assignments. A space will be provided for your signature each week. Please feel free to write any comments in the planner. We will check for signatures and comments when homework is submitted each week. Student planners should be kept in the zipper binders or expandable file folders and will (1) help the children learn to organize their assignments and responsibilities, (2) provide a beginning tool for children to set goals and reflect on what has been learned, and (3) offer critical communication with parents regarding calendar, homework, goals, and reflections. Please check your child’s planner on the day homework is assigned each week and help them plan their week. Sign in the space provided so that we know that you have read the plan and are aware of what the homework is for the week. Homework – Research has shown over and over again that homework has minimal benefits in elementary school. For this reason, homework (asides from reading) will only be sent home on occasion - a small amount of practice helps create positive habits and connects home life with school. While I want children to do their homework independently, I also value homework as an opportunity for parents to look at schoolwork with their children. It provides parents a window into the learning happening at school. 3rd and 4th graders are expected to read for 30 minutes every night, or a total of 2 ½ hours a week. In addition to independent reading, it is valuable for you to set aside time to read out loud to your child. This is a special bonding time and it also allows your child to hear you model fluency and enjoy texts they cannot yet read independently. Time and time again, research has proven that reading aloud to a child is one of the most important factors in a child’s success in literacy and in becoming a life-long lover of reading. Any additional homework will be written in planners at the beginning of the week and posted on the website. We will send home activities related to our current studies in the classroom. Generally, homework will be assigned weekly. This allows children and families the flexibility of completing homework according to individual family schedules. Children can always request more time, work on the weekend, request a refresher lesson, or other support. We do not, as a rule, assign homework during school holidays. We do assign homework during our conference weeks, as they are not school holiday. Homework should take no longer than 20 minutes a night and is meant to solidify concepts already learned in the classroom and provide further practice. If homework feels like too much for your family, please come talk to me. I suggest that you create a “homework spot” at home - a place that is only used for homework. This supports kids in getting straight to work. When possible, set aside the same time to do homework every night. I recognize this is not always an option, but consistency is key in learning. Scholastic Reading Club - We will be ordering books from Scholastic this year. It’s a great way for students to add books to home libraries while the teacher simultaneously earns books for the classroom. Visit the scholastic website and enter our class activation code: NMPBF. Books will be delivered to school and I will send them home with your child. Thank you for sharing your children with me and the 3/4 team! We look forward to working together to create a fantastic 3/4 experience! We only have your children for a short time in their journey through life, and we want to make a contribution that lasts a lifetime. In a learning community made up of unique individuals, each with their own learning styles and interests, our goal is to make sure each child feels at home in the classroom and is able to reach their potential. Please refer to the Horizons Parent Handbook found on the school website for any further questions regarding policies and procedures. 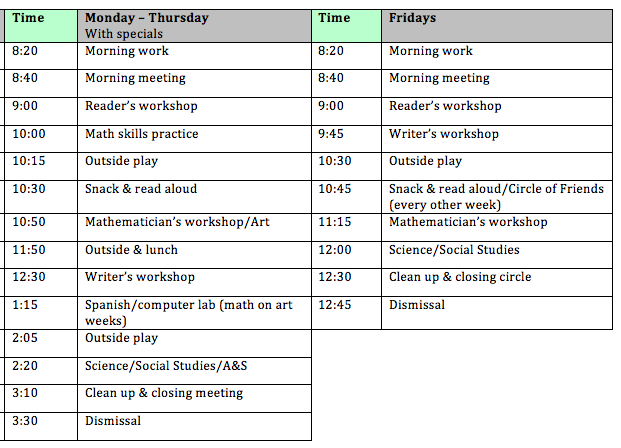 Please note that the daily schedule is subject to change based on the content being studied and other school events. Fruits and Veggies: orange slices, apple slices, bananas, grapes, blueberries, raspberries, melon, carrots, celery, cherry tomatoes, cucumbers, sweet peppers, broccoli, etc. Protein: cheese slices or sticks, nuts (depending on allergies), hard-boiled eggs, edamame, yogurt, beans, sliced lunchmeats, jerky, etc.